Every once in a while I like to deviate from the usual proper sit-down restaurant and delve into something that requires me to pick up food with my hands. 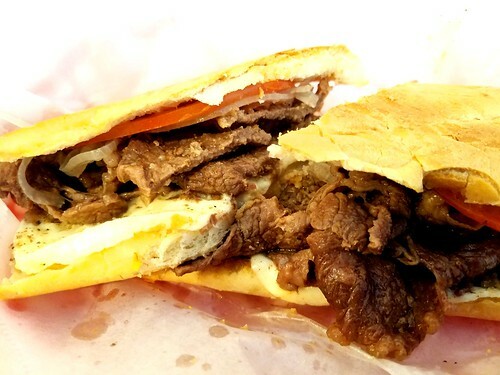 Having had a craving for a really good sandwich, I knew that I could not go wrong with a Cuban sandwich. And rather than going to the usual Cuban sandwich shops that I have logged in my smart phone, I looked for a place where I had not been. 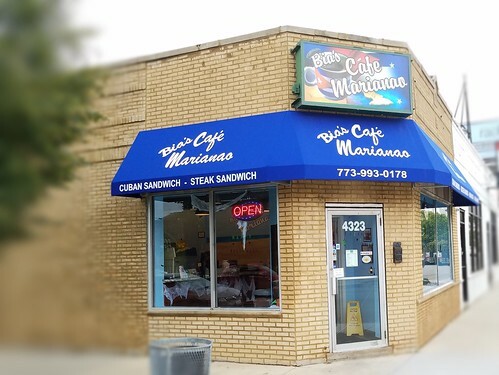 Bia’s Café Marinao at the new location of 4323 W. Addison Street in Chicago’s Old Irving neighborhood seemed like it was a good spot on reading the menu. It was an outstanding café on going for the first visit. 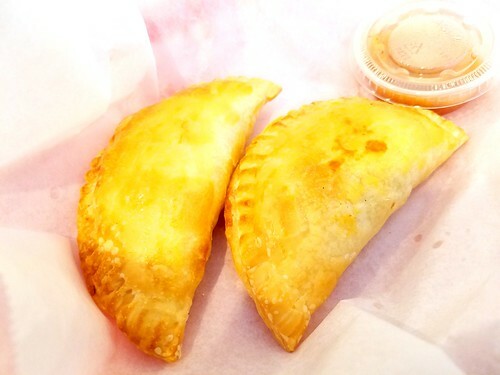 Not large and rather popular, given the constant flow of patrons coming for pick-up and dining in, I had a seat at the counter against the wall and indulged a chicken empanada that came with a guava barbecue sauce and a cubano. The empanada was fresh, quite evident from the flaky crust. And I liked that the chicken was seasoned nicely, which really lent itself to going well with the guava barbecue sauce. Ropa viejas have always been my go-to Cuban sandwich and switching it up a bit this time was an excellent idea. Thinly sliced ham, roasted pork, topped with a mustard jam and pickles, I quickly decided that I will retire my love affair with ropa viejas. During my second visit, I wanted to sample another sandwich. 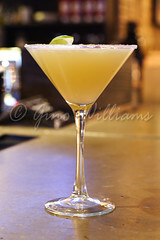 This time I ordered a medianoche. This sandwich is very much like a cubano, except the bread has a bit of a sweetness to it and without the mustard jam. 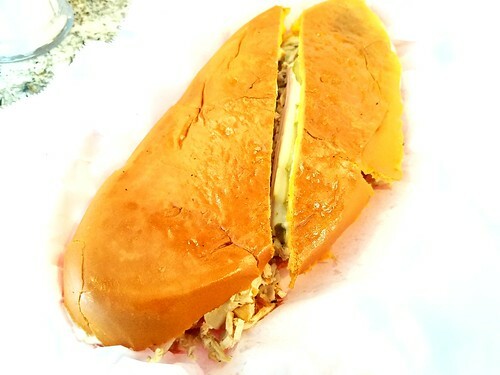 Hearty, flavorful, and with a bloom of flavor from each bite, I was conflicted because I had sworn the cubano to be my now-favorite Cuban sandwich during my first visit. While finishing the medianoche and downing a cup of café con leche, I knew that this meant I had to return at a later date to see if I could conflict my interest more. During the third time, I had one beef and one chicken empanada, this time with a spicy sauce for dipping. Again, trying a different sandwich, I ordered a steak and cheese that came with thinly sliced tomatoes and Swiss cheese, drizzled with a mild citrus oil. While not overloaded, there was enough flavor packed into the sandwich to make me punt a Philly cheesesteak if it were put in front of me. Not only that, I simply had to accept the fact that there isn’t one sandwich at Bia’s Café Marinao that I can’t honestly call my favorite because all of them are. 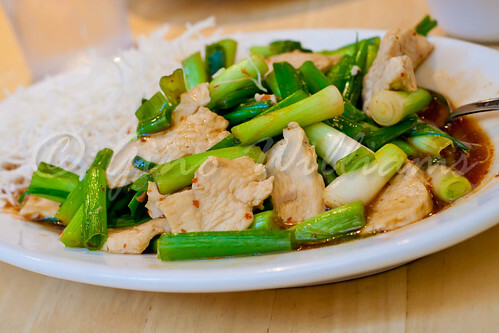 As mentioned earlier, there is a steady stream of customers that come in to order for take-away and for dining in. Noticing the service the three different times that I have gone, they are consistently friendly and attentive. The café is not in an area with lots of foot traffic, so the fact that they get a lot of constant business speaks to how fantastic the sandwiches are and how welcoming the service is. I have never been one to say that I am a fan of sandwiches, but Bia’s Café Marinao changed that for me. This is my favorite sandwich shop in Chicago. Logan Square had a small walk-up on the far west end of the neighbourhood for years. 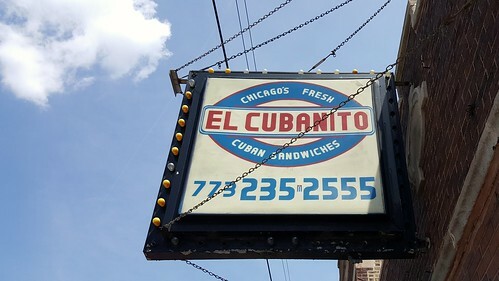 El Cubanito at 2555 N. Pulaski Road was a favourite that served Cuban sandwiches and was a magnet for locals as well as those from other neighbourhoods. And as many times as I had walked by it, I never got in any of the long lines to try out their sandwiches. And then there was a change to the walk-up. It closed and expanded into a nice sized restaurant. I then made it a point to go for a visit. 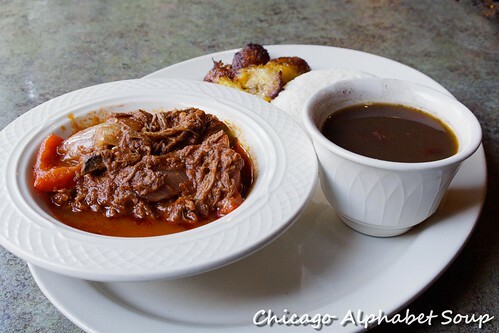 I had gone several months ago and had a ropa vieja since I wanted something fast. I was completely blown away with how much I loved the way they piled the sandwich with shredded beef in a rather savoury tomato-based gravy. 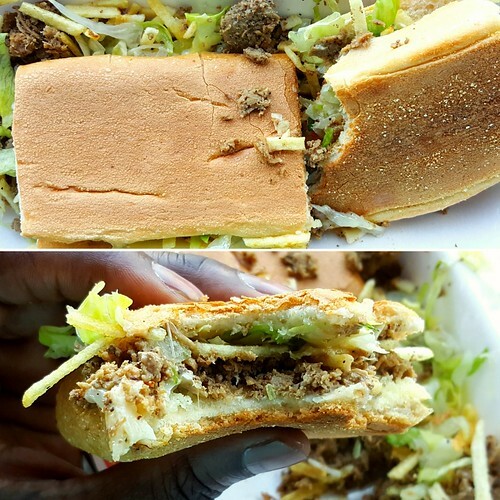 Added to that the plantains on the sandwich and I understood the long lines when the restaurant was a walk-up. Recently, I returned and had a steak sandwich. Chopped steak, swiss cheese, lettuce, shoestring potatoes, and house sauce fell from between the bread. There was nothing neat about the sandwich and that was fine, especially once each bite captivates you. Besides, you get a fork so that you can finish anything that falls back into the carton that the sandwich comes in. And the cafe con leche I ordered resulted in me returning a day later for another one. 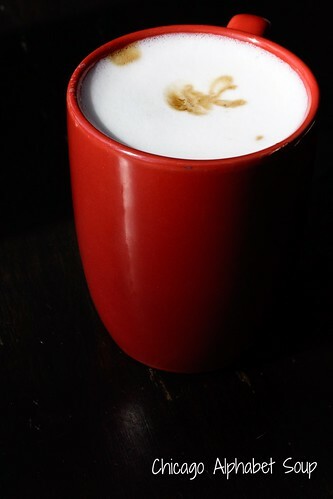 Like other Cuban restaurants I’ve gone to, the cafe con leche is addictive. There are a few other sandwiches on the menu, a house soup, arroz con leche, flan, and beverages ranging from coffee to sodas. 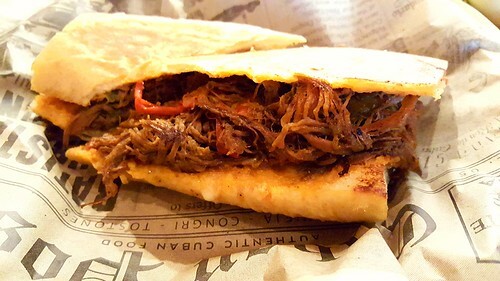 There isn’t an extensive menu and this may serve El Cubanito well because they’re excelling in a few sandwiches rather than being all over the place with a booklet of items to prepare. If there is one thing I have learned about these small cafes and walk-ups is that the lines are not long because those places are novelties. The lines are long because the food makes you forget whatever promises you’ve made to someone else and show up so that you can get fed. A few weeks ago while going to a restaurant in Chicago’s Roscoe Village neighbourhood, I noticed a Cuban restaurant on the landscape. Cuba 312 at 2054 W. Roscoe Street was apparently new, as of the past few months. Or I had been distracted by other restaurants on the block. Needless to say, there was no way that I was going to let time slip by me without going to see what kind of food fare they had for my appetite. Comfy and spacious on the inside, the server greeted me with a hearty welcome. That set a tone for great customer service. And because I had arrived not too soon after the doors had opened for business for the morning, I had a bit of time to order in an experimental fashion without any rush. There were a few items on the menu that piqued my craving. 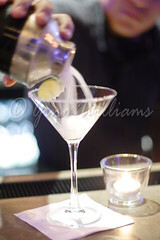 I mentioned my likes and let the server make recommendations for appetizers and a sandwich. While I waited for the food to come to the table, I had a cafe con leche. Let me say that if you go to a Cuban restaurant and turn your nose up at the option of having a cafe con leche, you should be ashamed. 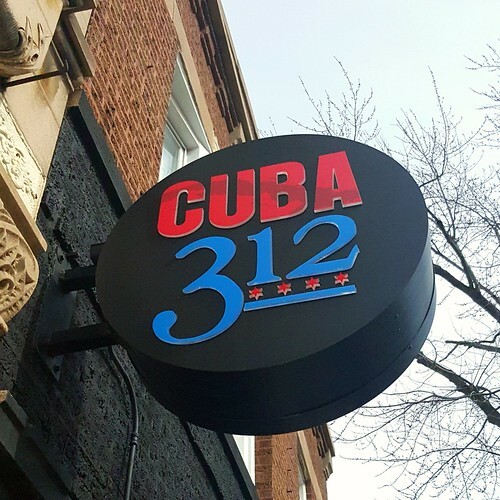 At Cuba 312, there seemingly was a balance to whatever measuring they did such that the cafe con leche was not excessively sweet and whatever bean they used for the coffee was of high quality. 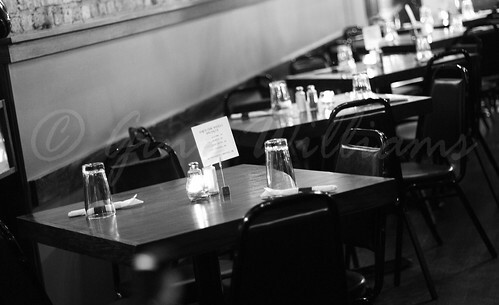 First to the table was an order of empanadas. There was a chicken empanada that had well seasoned, shredded chicken and potatoes in a savoury sauce. There was also a seafood empanada that was in another tasty sauce. Served with a chimichurri sauce, the window seat was the wrong place to sit for a display of food happiness experienced at each bite. 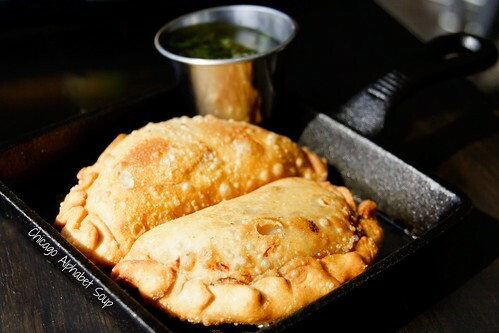 For years I had searched for empanadas to rival some that a Chilean restaurant I had gone to served before they closed. My search ended today at Cuba 312. Next to the table was the sandwich of all sandwiches. I had a jibarito pollo. 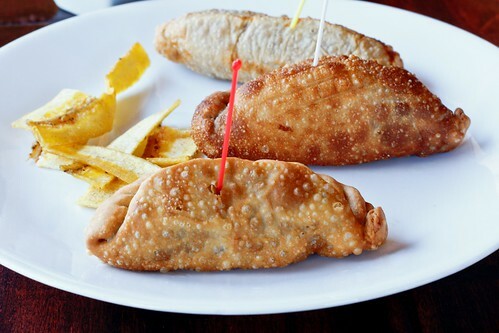 Many say that jibaritos became a staple born out of Cuban communities in New York City rather than off the island of Cuba. Yeah, yeah, yeah. 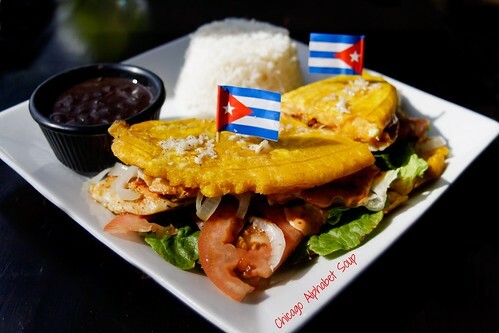 Whatever Cuban came up with the notion of a sandwich served between tostones, or pressed and fried plantains, created a masterpiece wherever he or she was. And following in that tradition, the jibarito at Cuba 312 came with seasoned, tender chicken, lettuce, tomato, cheese, and a zesty mayonnaise that resulted in the sandwich getting undivided attention. This dish came with white rice and frijoles that also felt my appreciation. It was a casual morning, so I treated myself to two desserts. The first one was a honey pistachio flan. Wow. Once you have had a flan that is creamy, and not of the Jell-O variety, you will take a vow of never eating flan of any other texture. The server described the texture as that of crème brûlée, but it seemed less grainy, almost like a combination of a mousse and custard. Topped with whipped cream and a strawberry, this falls into the cloud 9 dessert category. 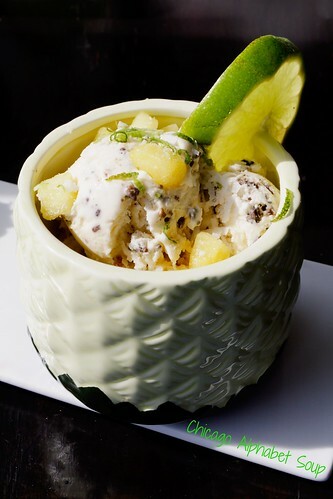 And, as if the flan was not already an outstanding item, there was a cup full of coconut sour cream cake with pineapples and lime zest accompanied with toasted coconut ice cream. Jesus Christ. Muhammed. Buddha. Osirus. Odin. Zeus. Ego. Money. I think this was a feature dessert. All I can say is call ahead to see if it is on the menu. It is a must-have. The Roscoe Village stretch of Roscoe Street between Western Avenue and Damen Avenue is a pedestrian’s fun spot. From clothing boutiques, to wine shops, to brunch locations, to eateries with international cuisine, there is something certain to appeal to your sensibilities. 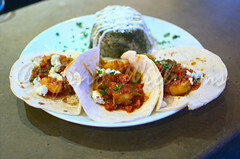 And if you are one who enjoys authenticity in your food, Cuba 312 is one of the few restaurants that I recommend highly. One thing that I am a stickler about in my dining experience is service and the service here is arguably top. 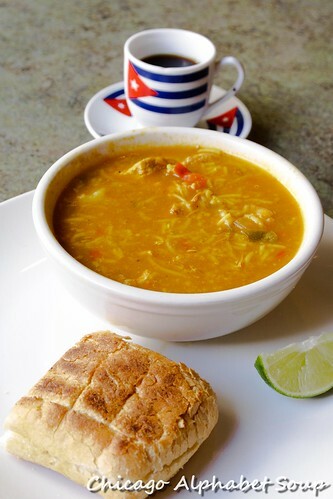 Add to that some good Cuban food, you don’t have to wait until flights to Cuba from America open up. Va a Cuba 312 a 2054 W. Roscoe Street ahora. ¡Rapido! The thing about engaging strangers in conversation and they finding out that you are more of a fan of seeking restaurants that deviate from group think, they offer suggestions that put you in the path of authenticity. 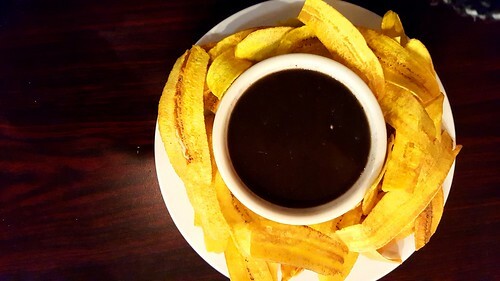 While recently switching between English and Spanish with a friend talking about wanting to find a restaurant in Chicago’s Humbolt Park area, some Cubans who overheard the conversation quickly recommended Señor Pan Cafe at 2615 W. North Avenue. 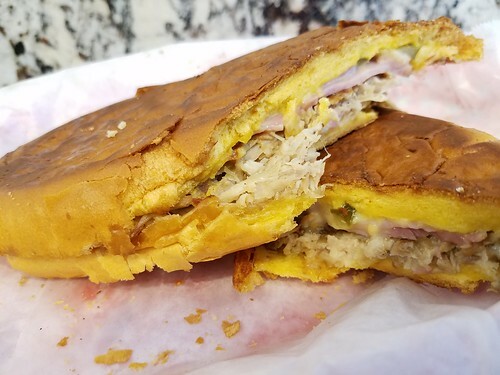 This was not the first time I had received a recommendation for this cafe from Puerto Ricans or Mexicans, so hearing it from Cubans meant it moved to first place in my “Must Go” list. And upon entering and hearing the rapid fire Spanish at most of the tables spoken by Cubans, I’d hit oro (gold). For a starter, I ordered plantanos fritos y frijoles negros. The thinly sliced, fried plantains looked a tad bit too perfect. The texture and flavour spoke to just how perfect they were. Crispy such that they didn’t get soggy, I used them to dip the black beans that had enough seasoning without crossing the line into ridiculous. I could have had this appetizer in an entrée size. I had already settled on ordering a sandwich. Many of the sandwiches on the menu were pork-centric. The one sandwich that I knew I could fall back on was the ropa vieja, since it had a recipe of shredded beef in a tasty tomato sauce. Dios mios. At most Cuban restaurants where I have gone, the ropa vieja sandwich had plantains in the recipe. That was not the case at Señor Pan Cafe. That was not a problem either, as the sandwich was substantial, and I had ordered the small version of the sandwich. I had finished all of it and all of the plantanos fritos y frijoles negros. There was no room for dessert. 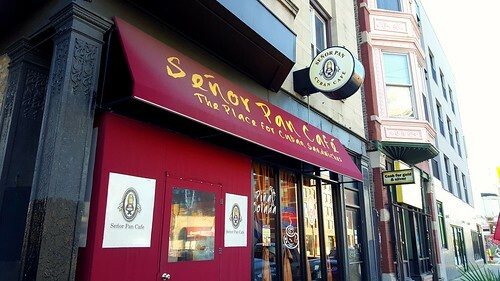 Señor Pan Cafe is small, so consider going with a small party if you’re interested. With me being conversational in Spanish, I had a little more conversation with the server and a few others in the restaurant than I probably would have if I had not switched into Spanish. 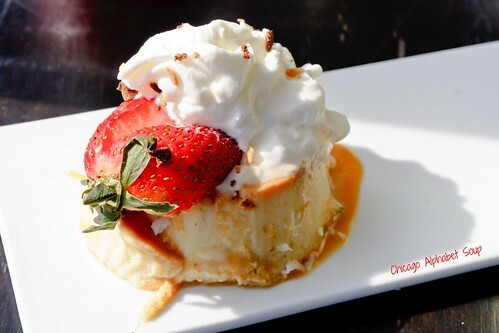 For example, although I did not order a dessert, when I had inquired about a certain dessert on the menu, everyone behind the counter was telling me to get the flan instead when I returned. They also told me to come for breakfast, which goes well beyond, “Thanks for coming and we hope to see you again soon.” I was one satisfied customer. And since I did exchange email addresses with the Cubans who recommended it, I sent them a note to thank them. The quick response I received: When are you going again? 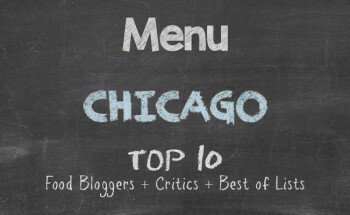 While wanting to get closer to Montrose Beach along Lake Michigan on Chicago’s North Side for a friend’s gathering, my appetite would not allow me to linger around with a growling belly before the come-together. I was in the Lakeview area in advance and not trying hard to tolerate my hunger pains. 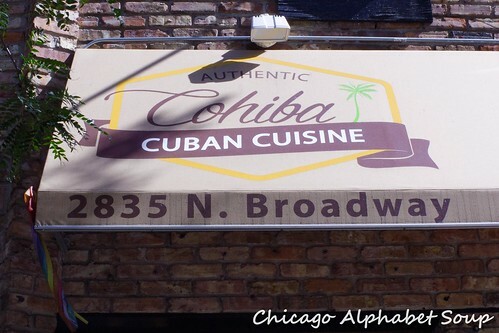 As luck, fate, or serendipity would have it, I was standing in front of Cohiba Cuban Cuisine at 2835 N. Broadway Street. Talk about great timing. Talk about being decisive enough to just go in. Talk about channeling my inner Celia Cruz: ¡Azucar! 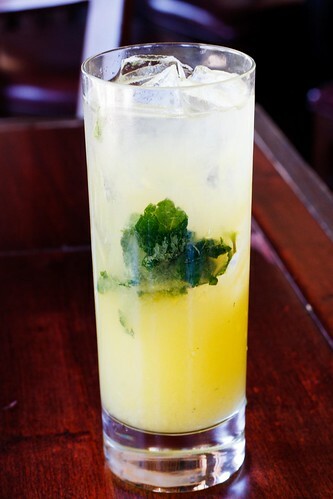 Realizing that I had plenty of time before the mid afternoon, I scanned the menu for something to satisfy my craving. There was a moment of indecisiveness before I said that I would start with a tostones rellenos de camarones, followed by a sopa de pollo. Curious as to what my server would recommend for a main dish, I accepted her suggestion for ropa viejo. 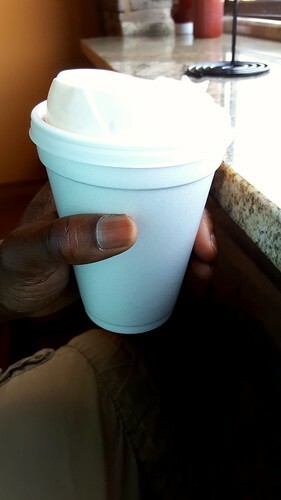 And during my wait, I had a cup of cafe con leche. 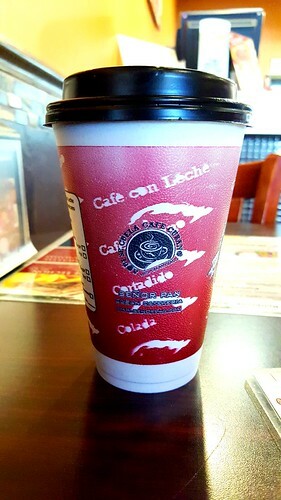 There is definitely an assurance that getting a cafe con leche at any Cuban restaurant or cafe may be the best option you exercise for the day, the cafe con leche at Cohiba being the one option of the day that I think made my day bright. Seeing that the tostones rellenos de camarones was on the appetizer list, I thought that it was going to be small. It was rather substantial and an automatic favourite by the first bite. 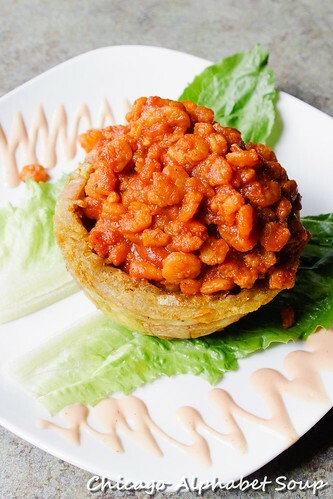 This was a green plantain stuffed with shrimp prepared in a tasty tomato sauce. Not peppery, but spicy nonetheless, I devoured as much as possible, while saving room for the sopa de pollo. This was the first moment that I mumbled ¡Azucar! under my breath. Filled with tender chicken, peppers, and miniature noodles, and with a chewy roll that was also ideal for sopping, I was quite pleased at having ordered this menu item. Requiring some time before indulging the main dish, the server waited accordingly before bringing me a traditional Cuban dish that I usually order as a sandwich. The flavour of the shredded beef in a tomato base was mild, but it still was inviting enough that I refused to leave any. 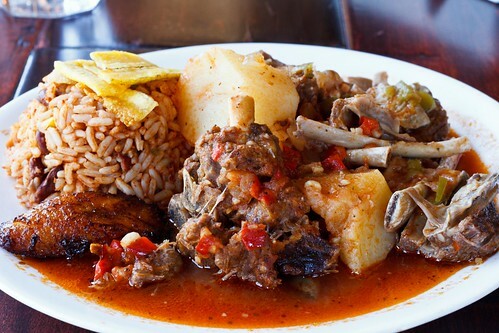 This was served with savoury black beans, sweet plantains, and rice. Thankful that the large party sitting not far from me was fully engaged in animated conversation, I was glad they did not hear me singing “Guantanamera” by Celia Cruz and mouthing ¡Azucar! Needless to say, these old clothes I liked a lot. Now I was proper fed, but I was not yet finished. 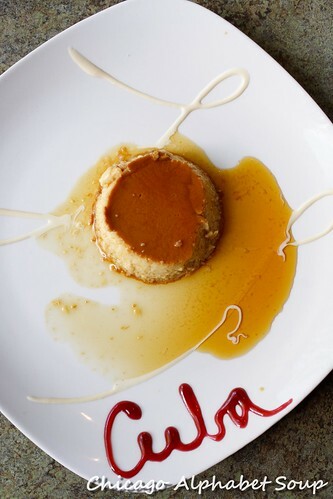 Per my server’s second recommendation, I had traditional flan de vanilla. Accompanied by another cafe con leche, I don’t know how I managed to walk upright after I was done. This was not some flan from the frozen section at a local market. I appreciated the caramel not being excessively sugary. And the flan had the texture of creamy quesillos. 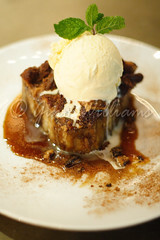 Also, having eaten so much already, the flan was just right for me being able to finish all without struggling. 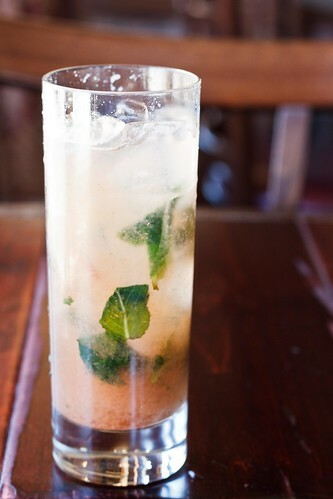 Cohiba Cuban Cuisine is a medium sized restaurant with an “at home” atmosphere that I love. I went during late morning/early afternoon before the crowd began coming. Lucky for me because I got to not only enjoy the meal, but to at least get recommendations and even chat about Cuban food without there being any rush. 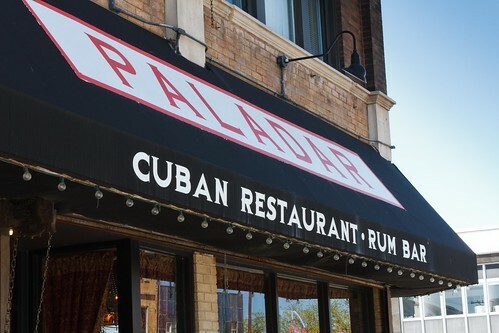 There are a few Cuban restaurants I have gone to in Chicago and several that I will have to try in good time. But this was the first time that I couldn’t suppress my inner Celia Cruz. ¡Azucar!. Earlier this week I went to one of the Cuban restaurants where I had gone in January — Cafecito. This time a colleague who had recommended the restaurant accompanied me on my visit. Upon entry, the owner greeted me by name and I greeted him by name. We chatted at length and when I introduced my colleague, he asked if she was the one who had told me about the restaurant. 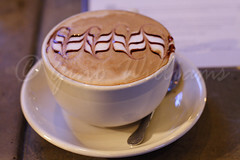 He had read the journal entry I had written about my experience at Cafecito and his recollection of the statement I had given about my colleague recommending the place was very telling. His brand of authenticity will be missed greatly. Throughout the week, I finally experienced the bittersweet moment that I knew would come eventually, with me soon to depart Chicago. I got a chance to meet with a few past co-workers, great friends, family, a past supervisor, and several others who have become significant parts of my circle. They jokingly rubbed in the fact that my constant appetite will keep me in some eatery in DC stuffing my jaws and that I will perhaps gain weight. They gave me names of cafés, restaurants, and holes in the wall that will certainly please the palate. A few paid for my Chicago Symphony Orchestra tickets and one volunteered to take my Chicago Lyric Opera subscription. And they all blocked my time for the remainder of my stay so that we could fellowship. Their brand of authenticity will be missed greatly. 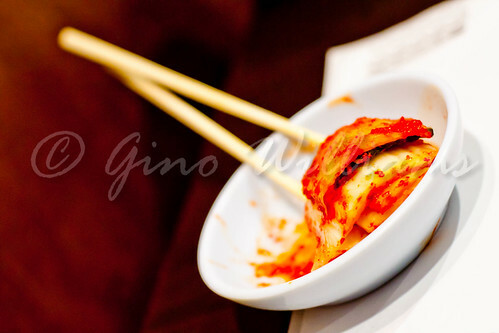 On Friday night, I returned to a certain Korean barbecue restaurant in Chicago’s North Side named San Soo Gab San. Teeming with people, this house of all good eats was perfect for escaping wet, dreary weather. Rainy on the outside, warm and toasty on the inside, one of my great friends and I had decided to meet to get our fill of countless little bowls of edibles, and entrée of a savoury noodle dish, and meat on a hibachi. With cameras in hand and a camcorder, too, this time, I was ready. And my great friend was equally as ready as he brought his fantastic camera to capture the impressions left on the table for us to address and the final snapshots of how aggressive we were with the treats set before us. For anyone who has gone to any Korean barbecue restaurant, you are well aware that nothing comes to the table ala American fare. Little bowls of this, that, and the other are stacked on the table in whatever spot available. 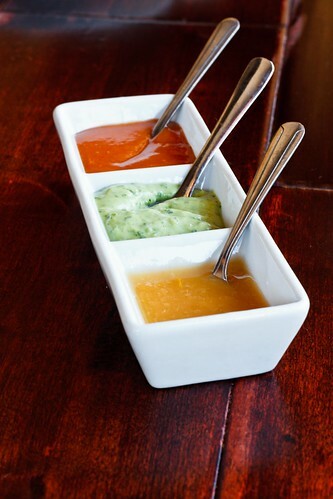 When you think that there is no more room because an entrée has arrived at the table and plates of raw meat so that you can grill yourself have been brought, the servers figure out how to move things around to make more room for additional small bowls. Aye, aye, aye! Kimchee, potato salad, potatoes, lettuce, spiced pickles, bean sprouts, spiced tofu, water vegetables, peanut sauce, and things that you simply eat so that you can make space are there for the sampling. 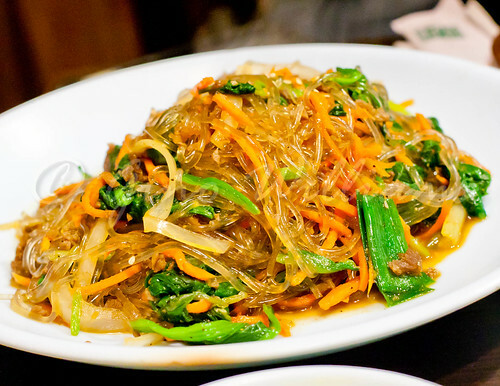 Although I am primarily vegetarian, albeit not one leading a crusade against eating meat, I had some chop chae. This plate of happiness — clear noodles, chopped beef, onions, and scallions — went down the gullet with no complaint and no wicked side effects. Well, that is unless you count being sleepy afterwards a side effect. 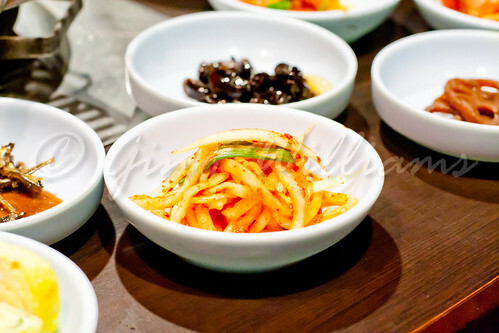 There was bulgolgi, which is well-seasoned beef, shredded nicely, and doctored with a splendid amount of spices that went on the grill and cooked to bliss. Same was the case with the lip-smacking chicken. 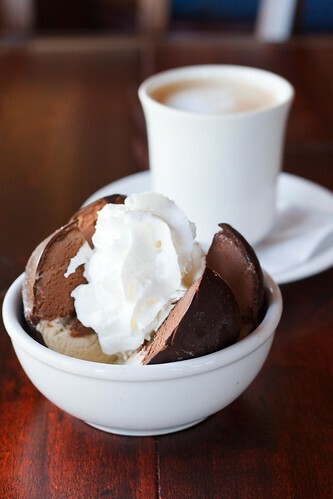 Gobbled up with all of the small side dishes, my great friend and I did one of the most awful things afterwards: we went and had gelato at Paciugo in Lakeview. I am not talking about a manageable scoop of one flavour either. No, there were four scoops stuffed into our individual cups and tended to with utmost diligence. Oh the shame of it all. Saturday I spent a moment downtown taking in some architectural photography. Most of it was inside because the wind that whipped back and forth from Lake Michigan was a bit more nippy than I had anticipated. I visited the Chicago Cultural Centre and kicked my self, literally, for having not gone before now. The architecture, the attention to detail, the glass dome, the Tiffany dome, and the moment of relaxation that gave such ideal escape were exactly what I needed. After a few hours had passed, my belly started growling. Haha. Another great friend from Phuket, Thailand, met me downtown at a Thai restaurant after my photography session. Having gone to the restaurant, My Thai, it was great being able to see the manager and constant wait staff one last time. Where it became a quiet moment was when it dawned on my Thai friend and me is that we both are leaving Chicago, he to return to Thailand, me to go to DC. He was one of the first people I had met when I moved to Chicago seventeen years ago, an authentic friend who taught me how to speak in Thai in exchange for me giving him enough in French. Saying lacone, which means good-bye, sounded so final and it left me quiet for far longer than I could manage. This weekend ended with me catching up with the aforementioned colleague — who really is more like family — who had suggested the Cuban restaurant to me. 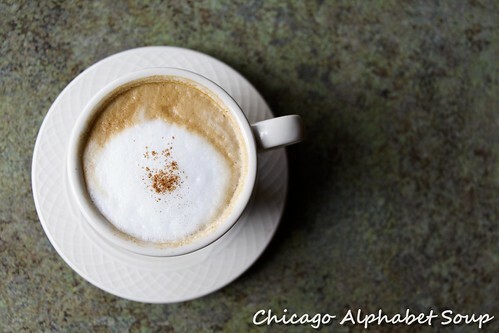 We met at Eggsperience, one of the American breakfast, brunch, and lunch restaurants in Chicago’s River North. We had fluffy pancakes, crisp waffles, scrambled eggs with cream cheese, freshly squeezed orange juice, a banana smoothie, and plenty of laughter. A quick walk over to Intelligencia, we watched the barrister prepare our coffee through some brewing process that looked more like a science experiment than mere percolating-and-pour. We took in a free concert at Chicago Cultural Centre, given by Chicago Chamber Orchestra. And a brilliant finish to the day was dinner at Tamarind, which is a Pan-Asian restaurant in Chicago’s South Loop, where we had chicken masala, spicy salmon maki, and another maki that was incredibly catchy to the eye and filling to the tummy. Of all days, I left home sans my camera. The food was journal-worthy.